First impressions for any business are vital so why not start by having your very own professionally printed business stationery. Whether it’s just Letterheads or Business Cards you require or perhaps you’d like the complete package consisting of Letterheads, Compliment slips, Business Cards and Continuation sheets, we can help. 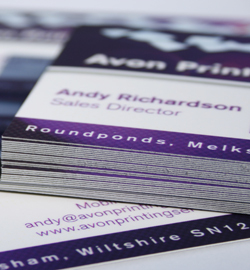 Avon Printing offers a wide range of text papers and finishes to create the look and feel that best suits you. We can tailor make the stationery package for you ensuring we utilise the most of the sheet and offer you a cost effective solution. All letterheads and continuation sheets are printed lithographically giving you the guarantee that they will run through inkjet and laser printers at your office or home. Contact Sam, Pete or Andy today for friendly advice and pricing.